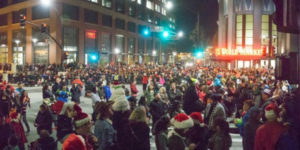 On Saturday, Dec. 3, the Redwood City Improvement Association (RCIA), a non-profit community benefit district ran by a board of property owners, residents, community members and businesses, will introduce a new tree lighting tradition to the annual “Hometown Holidays” event—a community-wide party in celebration of the holiday season from 10 a.m. to 6 p.m. The RCIA will be enhancing the event this year by investing $27,000 to light up two large, Redwood trees with red, green and white LED lights that surround the Courthouse Square. Hometown Holidays will include a parade, live entertainment, a holiday-inspired Magic Lantern 3D Show sponsored by the RCIA, ice sculptures, Santa, real snow and much more! There will also be activities to keep the kids busy all day including the annual Children’s Festival, carnival and petting zoo. The community is encouraged to bring their families and friends out to experience an entertaining evening for all ages and check out the new additions to this wonderful event.